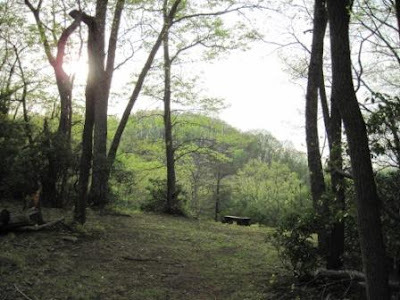 At the tippy-top of Two Bears Farm is a little hidden gem - our campsite. It's a mile and a quarter up, steep old logging roads, into a solitary hidden world. 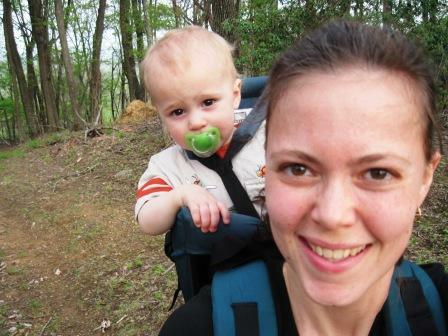 Cort and I did the hike together. And Reid rode on Daddy's shoulders. Would you look at how happy Pierce is? 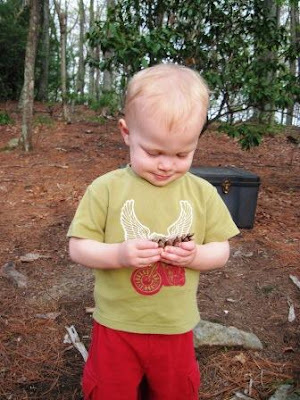 This is a kid that LOVES the woods. And I'm so proud of him for being able to make the hike all on his own - it truly is a strenous hike, albeit short. And yes, he's wearing pajamas. He insisted. 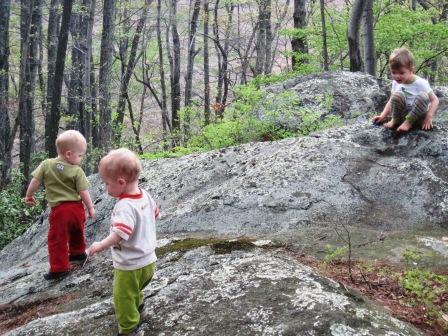 At the top, there are plenty of rocks to climb. Can you smell the fresh air yet? We brought supplies for s'mores! 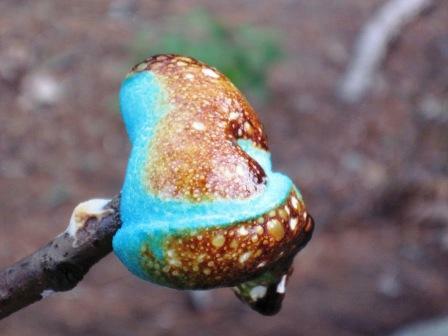 I'm always on the lookout for unusual marshmallows like caramel or coconut. This year I found MONSTER marshmallows! The hugeness! I wasn't quite sure how to go about eating this monstrocity of a s'more. No worries, though, I managed. So I had a brainstorm in the store that we could try to make s'mores from Peeps. Oh dear. That's just wrong. 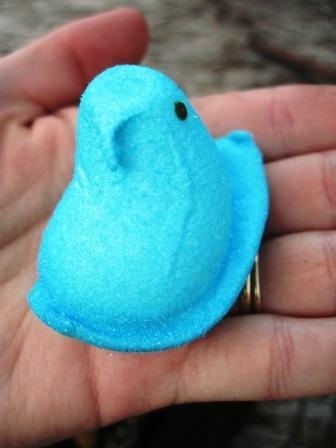 I have to say...peeps, when roasted, develop a hard caramelized shell of sugar on the outside. Oh boy is it good! 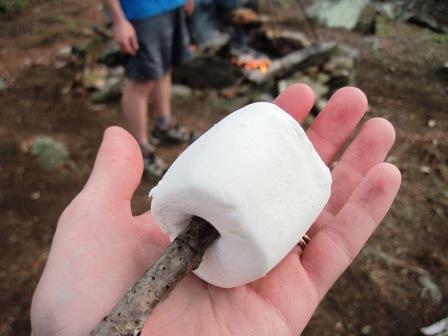 If you didn't have a campfire handy, I'm sure you could try this under a broiler. We may be forever s'more spoiled now. Can you get Peeps year-round? 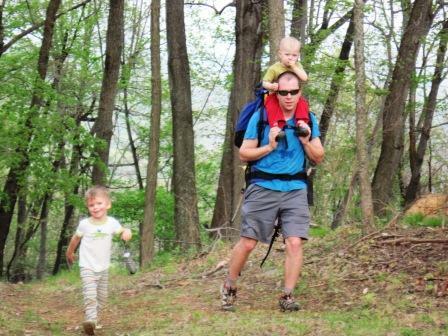 Pierce stayed up to camp for the night with his dad, and I carried BOTH twins simultaneously down the steep mountain in the dusk. My hips will be paying for this for days. 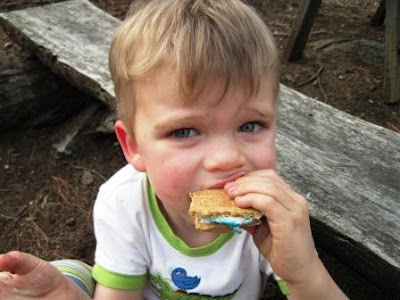 Do you have any special tips for making s'mores? It looked so sad roasted, but it sounds wonderful. 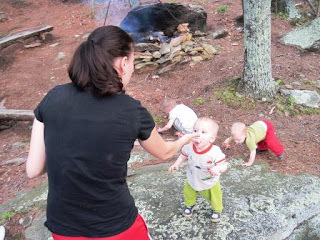 This looks like a great family tradition in the making. Roasted Peeps ~ who knew? Actually, I have a tip. If the Hershey candy bar is too rich for the little ones, swap out for Keebler's fudge-striped shortbread cookies and stick the marshmallow between that...less expensive too! And yes, I could smell the fresh air...ahhh. That must be so much fun, having your own private camping area. Glad you guys had a great time. Mmmm . . . s'mores! I love s'mores. 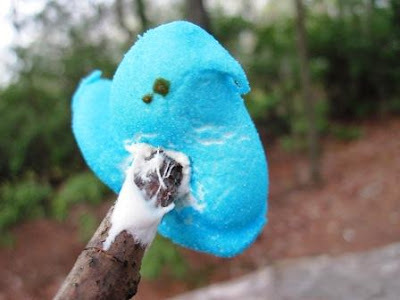 And that poor peep - sad looking, but delish, I'm sure! S'mores with peeps. I never thought of doing that. Ha ha colorful and delicious. Great pictures! My kids would love those giant marshmallows. How cool! I have to say I don't like Peeps! I might be the only person on the planet who doesn't. your boys have the best life. to have that in their back yard... and they have the best parents to let them experience it - see it, touch it, climb on it, taste it! Amy and I microwaved peeps once-they puffed up to such enormous proportions, that we almost split our sides laughing, it was so hilarious! This was the first year I noticed seasonal "peeps"-like jack o' lanterns at Halloween. So you could make peep smores year round. What a brilliant idea you came up with! You are one fit and healthy lady!!! But I know healthy farm living will do that. 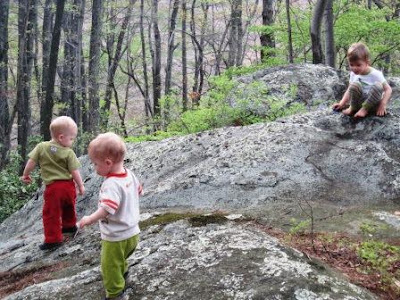 So funny that Pierce hiked all the way in his pajamas! 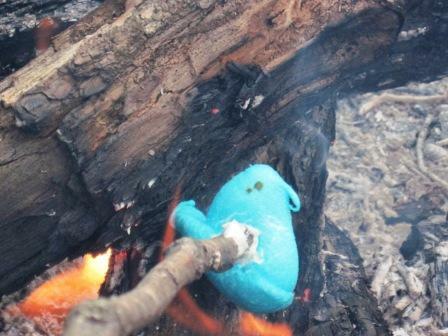 The stabbed Peep is a chilling sight, but now you have made me want to try one!! What fun!! Now I am wondering if you can get them all year long, I just recorded a list of fun facts about Peeps for our church, and I know you can get them for almost any holiday. Have you tried the chocolate dipped ones? They also have them with just chocolate on the bottom. Hope you have a wonderful Easter!!! ah, you all are wonderful parents getting the kiddos out in the woods this early. so many don't do that around here and they grow up knowing only computers and games. that peep didn't look very good and it's covering looked like a toad! i guess i have toads on brain after my post today...lol...have a wonderful weekend! Hey you are a peep killer - but if they taste good . . . guess it is okay. Oh your little ones are so cute - looked like they had so much fun. I found rectangle marshmallow's to use and there is a new container of chocolate in a tube for them at Wal Mart. What a heavenly place! Your boys will practically live up there when they're older I bet! How fun! I am slightly jealous. I want some outdoor time and soon! How beautiful it looks. Peeps ARE available all year round. I should get the coconut covered marshmallows for you. If I can find them in NY I'll bring you a bag at TypeA. Seriously. I don't especially LOVE 'em, but they are usually around at Passover and they're kind of oddly good. Anyway, those huge ones? Holy moly, yum! 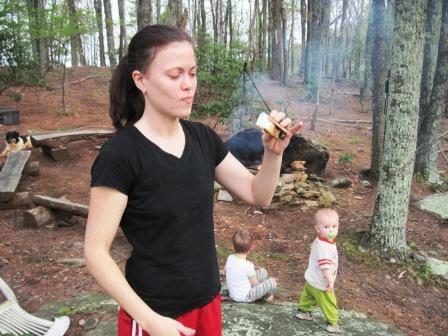 We love S'mores here. I have made them in the microwave when I've really craved some. But a new idea is Nutella. Ah, the heaven! What a wonderful trek through the woods- awesome memories!!!! Love those! What wonderful memories of that camping spot. That will be a special spot. And the peeps! What a great idea! I'm going to have to hit the clearance sales after Easter and get me some. 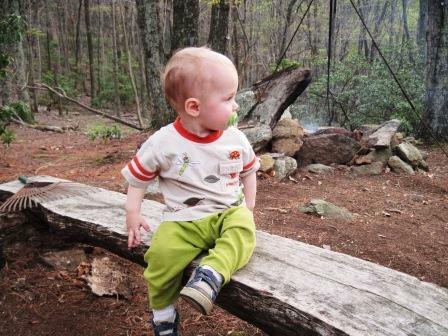 I have been camping since I was little and we still love to hike and camp. 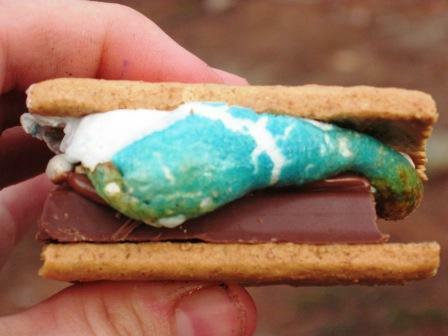 Your peep smore idea is AWESOME! I have never even thought of that. I showed my hubby and he agreed we should try it next time. That looks like a delightful time! And peeps smores are very clever! I don't really like peeps, but peep s'mores sound delicious! I will have to buy some on sale and hold onto them until I'm near a camp fire! 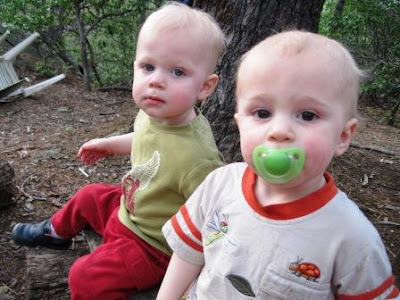 I also have to say, I'm impressed you were able to carry both twins down the mountain...I can barely make that hike without cargo! what a great idea, my husband is going to be a happy guy --- peeps'smores!!! your farm/woods is amazing, so beautiful. and to have that campsite as well, wow! it's fun seeing photos of you (adorable) with your boys (also adorable). Confession...I belong to the peeps fan club and yes, you pretty much can get them all year long. I have never roasted peeps though and will be trying it for sure.